This is a component to select a value from drop-down list. Drop-down list provides the filtering of values as the user inputs some text, and the pagination of available values. XML name of the component: lookupField. In the example above, the screen defines roleDc data container for the Role entity. In the lookupField component, a link to a data container is specified in the dataContainer attribute, and a name of an entity attribute is specified in the property attribute. In this case, the entity attribute is an enumeration, and the drop-down list will display localized names of all enumeration values. In this case, the component will display instance names of the Color entity located in the colorsDc data container, and the selected value will be set into the color attribute of the Car entity, which is located in the carDc data container. captionProperty attribute defines which entity attribute can be used instead of an instance name for string option names. The list of component options can be specified arbitrarily using the setOptionsList(), setOptionsMap() and setOptionsEnum() methods, or using the XML optionsContainer or optionsDatasource attribute. In the component’s drop-down list the values 2, 4, 5 and 7 will be displayed. Selected number will be put into the numberOfSeats attribute of an entity located in the modelDc data container. In the component’s drop-down list, two, four, five, seven strings will be displayed. However, the value of the component will be a number that corresponds to the selected option. It will be put into the numberOfSeats attribute of an entity located in the modelDc data container. setOptionsEnum() takes the class of an enumeration as a parameter. The drop-down list will show localized names of enum values, the value of the component will be an enum value. If you use SVG icons, set the icon size explicitly to avoid icons overlay. style="enable-background:new 0 0 55 55;"
In this case, instead of an empty row, (none) will be displayed. If this row is selected, null will be set to a related entity attribute. If you specify a list of options programmatically using setOptionsList(), you can pass one of the options into setNullOption() method. Then, if the user selects it, the component value will be null. STARTS_WITH − by the beginning of a phrase. CONTAINS − by any occurrence (is used by default). The new options handler is invoked if the user enters a value that does not coincide with any option and presses Enter. In this case, a new Color entity instance is created in the handler, its name attribute is set to the value entered by the user, this instance is added to the options data container and selected in the component. Instead of using setNewOptionHandler() method for processing user input, the controller method name can be specified in the newOptionHandler XML attribute. This method should have two parameters, one of LookupField type, and the other of String type. They will be set to the component instance and the value entered by the user, accordingly. The newOptionAllowed attribute is used to enable adding new options. The nullOptionVisible XML attribute sets visibility for the null option in the drop-down list. It allows you to make LookupField not required but still without the null option. The textInputAllowed XML attribute can be used to disable filtering options from keyboard. It can be convenient for short lists. The default value is true. The pageLength XML attribute allows you to redefine the number of options on one page of the drop-down list, specified in the cuba.gui.lookupFieldPageLength application property. align-center - align the text inside the field to center. 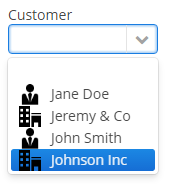 align-right - align the text inside the field to the right. borderless - removes the border and background from the text field.